The name is derived from Sanskrit, where its primary meaning is "bearing the yoke, the pole of a carriage, bearer of an era or strongest person of the era". The name Yugandhara (also transliterated as Yugandhara, Yoogandhara or Yugandara) is one of the ancient Indian names and is derived from the Sanskrit roots "Yugana" and "Dhara". 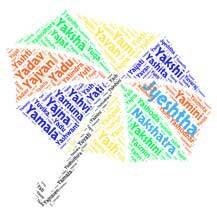 "Yugana" means "generation, year or era" and "Dhara" means "bearer, supporter, earth". Together, they indicate bearer of an era. Yugandhara is also one of the names of the earth. Yugandhara finds reference in Harivarnsa Purana in which Yugandhara is the name of a warrior who fought on the side of the Pandavas. Yugandhara finds reference in Mahabharata in which Yugandhara is a mountain. As per USA popularity chart is not shown, name Yugandhara is not popular in the USA. Yugandhara is a somewhat popular name in India Yugandhara is used by 178 people in India as per social media records. The Hindu baby name Yugandhara is unique. If you are looking for name with very good meaning, then Yugandhara is a good option. Yugandhara has a great sort of mythological significance attached to it. Yugandhara is not popular in the USA, because it is longer with 4 syllables and difficult to pronunciation too. Derived from Sanskrit (deva)meaning "god, deity".It can be v.. The word is derived from Arabic aman meaning 'security, safe..
Sanskrit name Pulastya refers to an ancient sage who was bor..
Vanshi is a Sanskrit name (Sanskrit: वंशी) which literally m..
Bavik means expressive, natural, righteous, prosperous and h..